I pull a 2011 Wildcat 302RLS 5th Wheel with a 99 Ford F350 dually. Can I tow with the current toolbox I have or do I need to either buy a low profile box or one down in the bed? Have seen people with that type box and towing fiver. You just need to back slowly into a sharp turn and see how much clearance you have. If ok in a flat turn, you may still have a problem when off level. I have a flush with the rails tool box, sits on the bed floor never really miss the 18” or 20” if I need to haul 8’ lumber I just put the tailgate down. 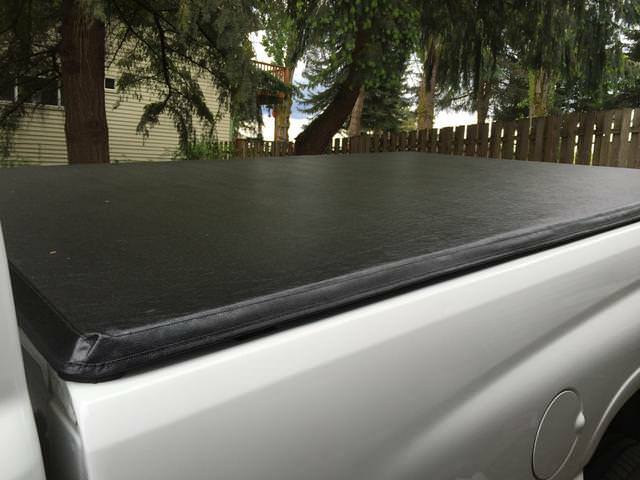 This also allows use of a roll up tonneau cover. My friend - blue truck - and I - black truck - found that the trade off for these “V” tool boxes - see pix in ref - is very worthwhile. They are flush mounted and do not weigh (empty) as much as the tailgates they replaced. Now that's thinking outside the box....I've never seen anyone do that but works and is functional as well. Good one guys! I have a flush with the rail tool box, and added a roll up Tonneau cover. The cover keeps the bed dry when not towing. Since you have a full length (8-ft) bed you SHOULD have no issues. Like wingnut said, test it at different angles so you know for sure. The design of the 5er front end will most likely be the determining factor as to how close it comes to your truck cab or toolbox. 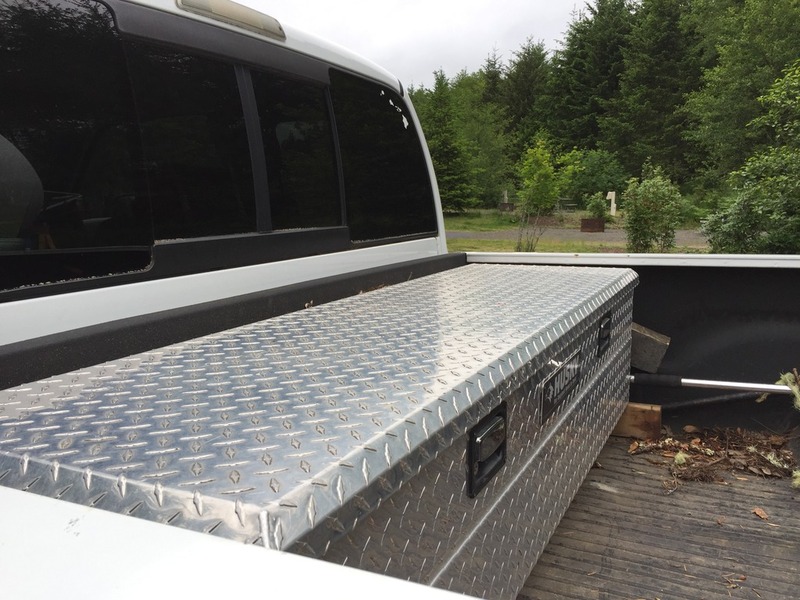 Our truck has an 8-ft bed with a toolbox very similar to yours and towing with my toolbox hasn't been a problem, ever. 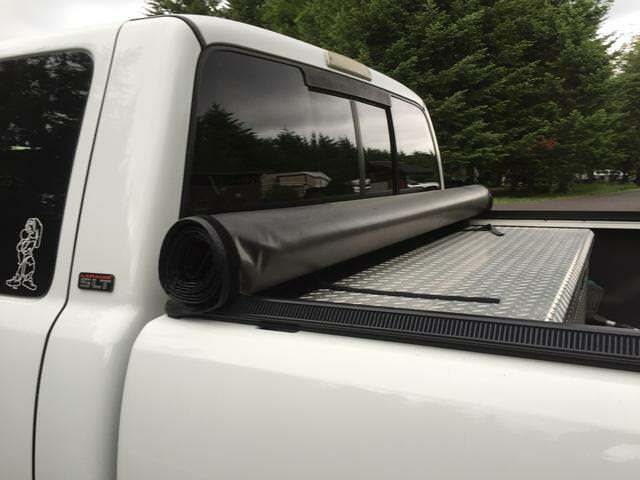 On the topic of tonneau covers, I found one that is designed for trucks with toolboxes that looks like a pretty slick unit. This lets you still access the toolbox, with cover rolled up or laid down. The main thing I'm not keen on, and this pertains to just about all covers I've seen lately, is the frame for the cover extends above the bed rails, reducing the clearance between the 5th wheel and truck bed. Most times it shouldn't be a problem but is something to consider. The nice thing is it looks like it rolls up to a fairly small package so it shouldn't interfere with 5th wheel/gooseneck towing.